It seems that Summer finally comes out of the blue. Today has been a very hot Monday. Are you ready for a trip among the stars? Don't forget your favorite scarf, 'cause it's pretty cold in the open space! This constellation lies between Aries and Gemini. with two open clusters: Iades ("The Triangle") and Pleiades (aka "The Seven Sisters"). This constellation is very old because the Bull is one of the oldest and fascinatin image (do you remeber Lascaux graffitis?) since Mesopotamia culture. The Mesopotamian epic poem Gilgamesh tell us that goddess Inanna send the Heaven Taurus against Gilgamesh to kill him (and Gilgamesh himself should be Orion, the Hunter). 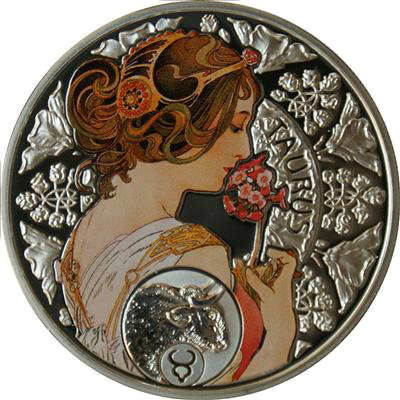 According to greek mythology, Zeus abduced phoenician princess Europa beyond the Dardanelles disguised like a bull. There's also the story of Io, one of Zeus love affairs, changed into a heifer by Hera, jealous Zeus' wife. Or the Bull could reminds us the Cretean Bull, one of Hercules's Twelve Labors. Taurus is the Earth's Fixed. A Taurus Born is a pacefull person. She loves pleasures, material things, life, calm, friendship and humor. She's a very strong-willed, practical person but she needs just a little hint of spirituality. Don't be too pragmatic! Use your imagination. Sometimes. It doesn't kill you! La Costellazione del Toro si trova tra l'Ariete e i Gemelli (maddai?!) ed è una delle più antiche, attestata sin dal Neolitico (ricordate le immagini nella grotta di Lascuax?). Il Toro appare nel Gilgamesh, dove la dea Inanna invia un Toro bianco ad uccidere Gilgamesh (che per alcuni sarebbe Orione, il cacciatore). Zeus si tramutò in un toro bianco per rapire la principessa fenicia Europa e portarla oltre l'Ellesponto, dando così il nome al nostro continente. Oppure potrebbe riferirsi alla povera Io, uno degli amori di Zeus, trasformata dalla gelosa Hera in una vitella. Oppure è il Toro di Creta, una delle Dodici Fatiche di Ercole? Fatto sta che nello zodiaco spicca questa figura cardine dell'antichità (Minotauro anyone?) facilmente riconoscibile per la presenza dei due ammassi stellari aperti, le Iadi e le Pleiadi. I've thougt to represent Taurus with a sprigly manicure. Daisies everywhere! So I started with two coats of KIKO 338 Light Lavender. Then I took NYC In a Minute #034 Giallo and with a medium dotting tool I made the center of the daisies. With NYC Expert Last Nail Polish 134 Pinestripe White I drew the petals. I didn't use top coat. 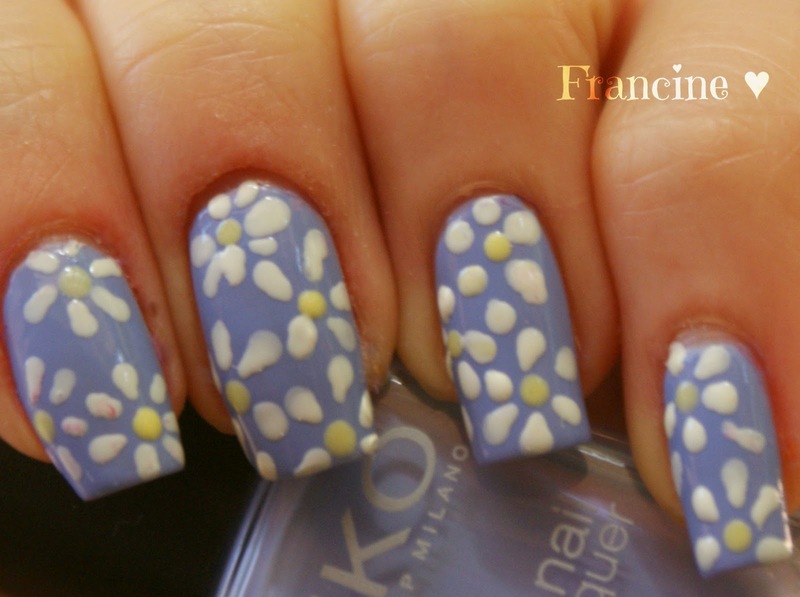 Siamo in primavera, quindi che ne pensate di una manicure piena zeppa di semplici margherite? Ho steso due mani di KIKO 338 Lavanda Chiaro. 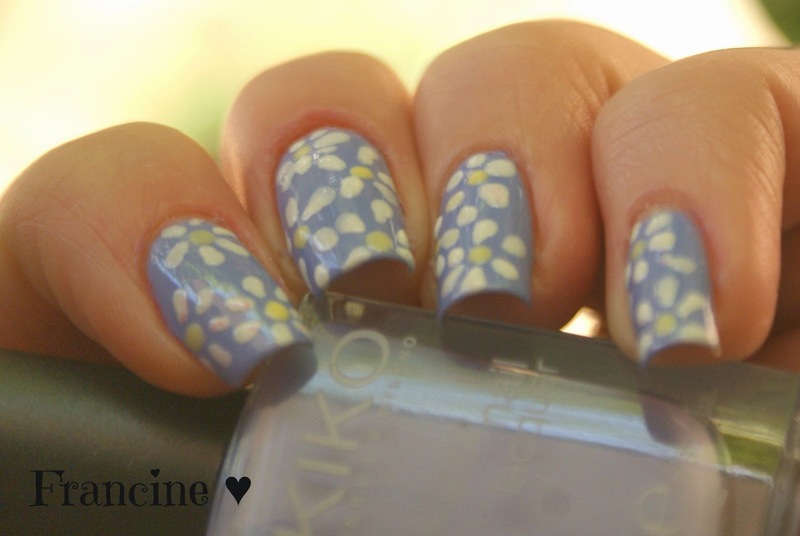 Con un dotter a punta media ho disegnato il centro dei fiori usando NYC In A Minute 034 Giallo, e con quello a punta fine ho creato i petali, usando NYC Expert Last Nail Polish 134 Pinestripe White. 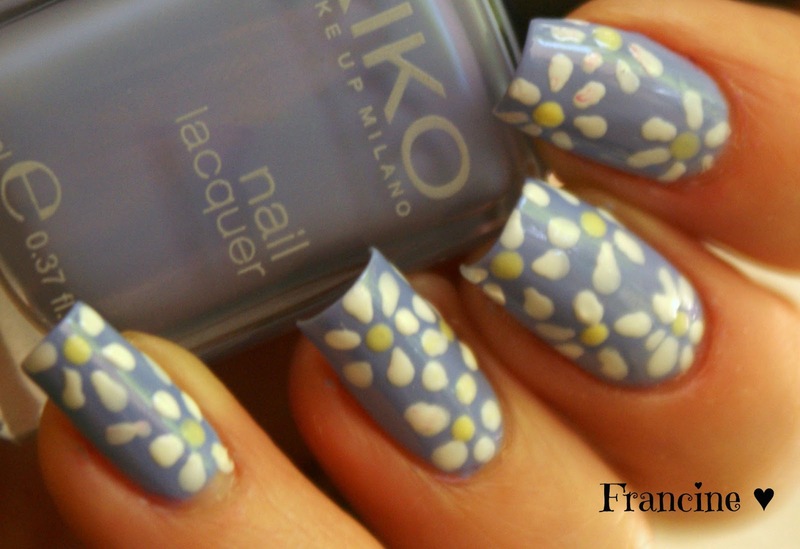 This nail art reminds me when I was a schoolgirl and during the launch break I played"He loves me - He loves me not" with my friends in the school backyard (I'm sorry for the gazillion of flowers we have destroyed... We was just romantic girls! ), laughing when the daisy foresee to us that he loves us, and crying out loud when he doesn't, even though we do not have any boyfriend! Did you have played "He loves Me - He loves me not"? How was it? 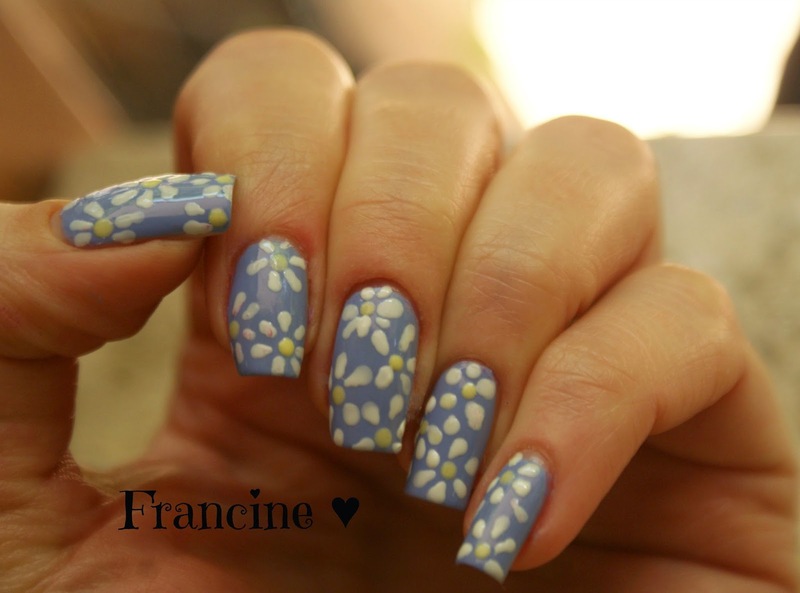 I hope also you liked my "he loves me- he loves me not" nail art! Ill keep looking at stars next month too. I hope we shall meet again! Thank you for stopping by my blog and have a nice day! Avete mai giocato a "M'ama, non m'ama"? eravate fortunate, o sfigate perse come me? Qualunque fato vi avessero predetto le margherite, spero che vi sia piaciuta la mia idea. Appuntamento al mese prossimo per vedere le stelle da vicino. Grazie per esservi affacciate e buona serata!